Are you looking for an irresistible Valentine’s Day treat? 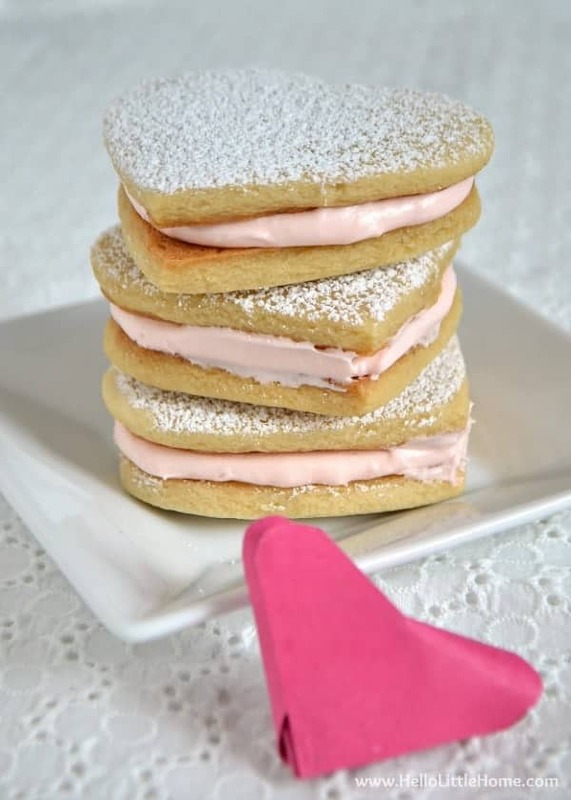 These Heart Sandwich Cookies are it! Hi, Ginnie from Hello Little Home here! Valentine’s Day is one of my favorite holidays, and I love coming up with fun ways to celebrate it. If you have a sweet tooth, Valentine’s Day is the perfect excuse to indulge it. A cute cookie is my favorite way to do that! 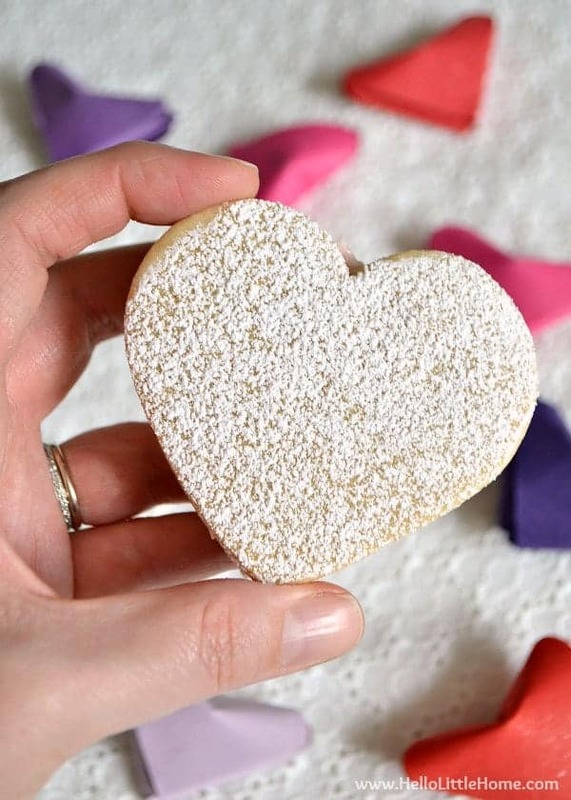 These Heart Sandwich Cookies have a delicious, not too sweet flavor. They’re crisp around the outside and chewy in the middle. Of course, the only thing better than a heart-shaped cookie, is a heart-shaped cookie with a white chocolate cream cheese filling. Yum! I can’t resist anything made with cream cheese, and this sweet, blush pink filling makes me so happy. Both the cookies and the filling are easy to make. Gather your kids and bake up a batch for all their friends! Cream together butter and sugars with a mixer until light and fluffy. Mix in vanilla, salt, and egg. Add flour to butter mixture and blend until a dough forms. Lightly flour a flat surface, then roll out dough to a little less than 1/2-inch thick. 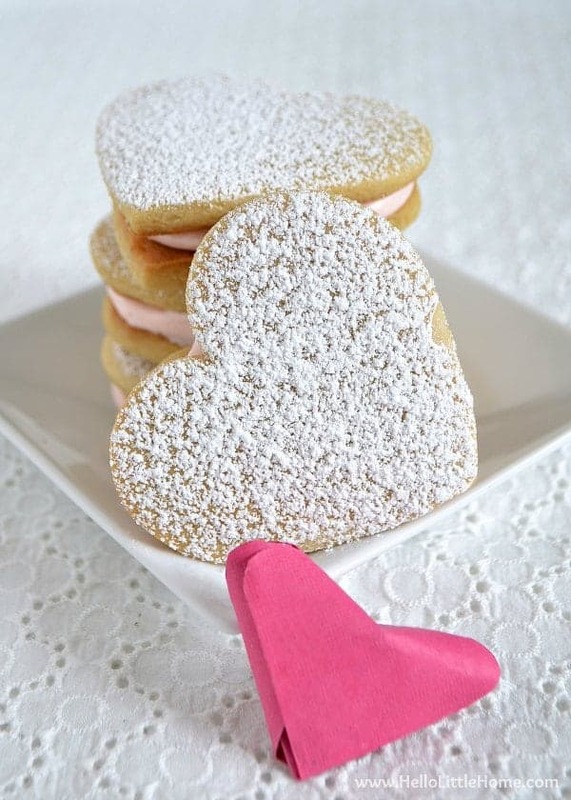 Use a heart-shaped cookie cutter to cut out 28 hearts (gather and re-roll dough scraps to get enough cookies). Transfer cookies to baking sheet. Bake until cookies are golden on bottom, about 8 to 10 minutes. Do not over bake. Melt white chocolate in microwave. Set aside. Blend together cream cheese and butter with a mixer until smooth. Mix in vanilla and white chocolate. Blend in powdered sugar until smooth. Add red food coloring a little at a time until you get a pink color you like. Spread white chocolate filling generously over bottom of a cookie, then top with another cookie. Repeat with remaining cookies. Place a little powdered sugar in a fine mesh strainer, then sprinkle over tops of cookies. Serve cookies immediately, or refrigerate until ready to serve. 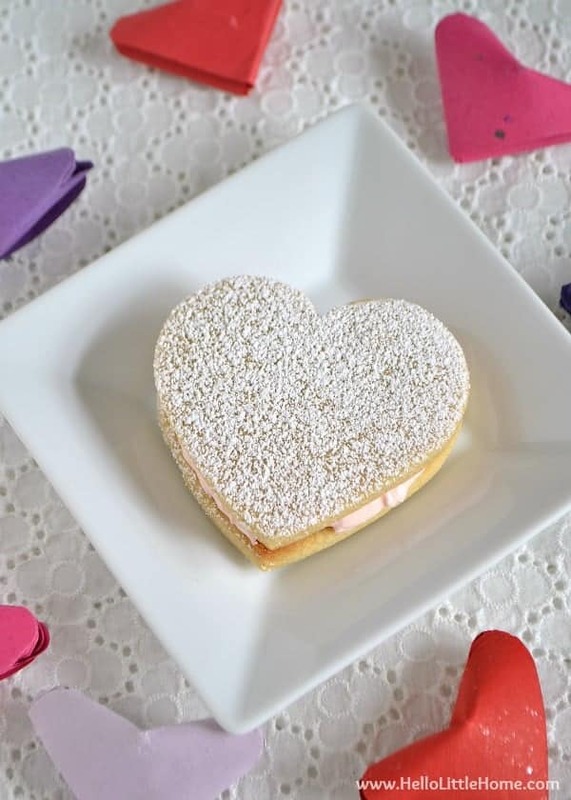 These Heart Sandwich Cookies are perfect for Valentine’s Day, but you can make these cookies a year round treat simply by changing the shape and/or the filling color. 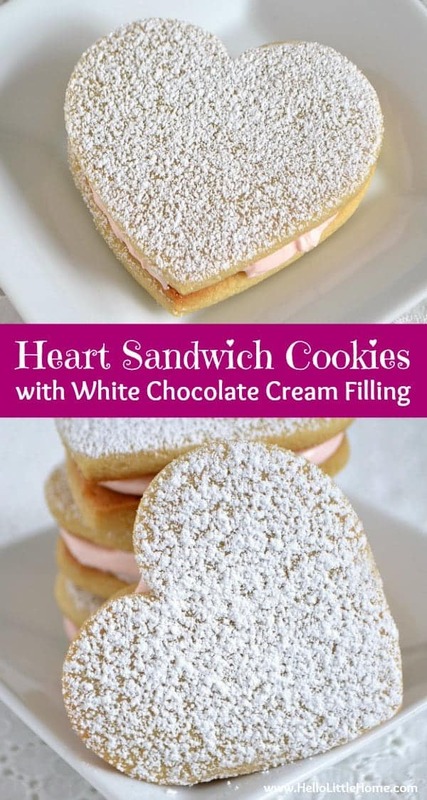 Did you like these Heart Sandwich Cookies? Then, you’ll love these other Valentine’s Day ideas, too! Love these, Ginnie and Kimber! Why is it that everything tastes better when it’s shaped like a little heart? My kids would go crazy for these! I love this! I think I will do these cookies for my 3 year old sons daycare lass for their valentines day party! They look easy and yummy! Thank you for sharing! Thanks, Kristin! I hope the kids love them!